Long Island New York Democratic House member Kathleeen Rice was out front in flexing against Nancy Pelosi getting the Speaker spot…. Rice has found out what happens when you get too far ahead of yourself…. 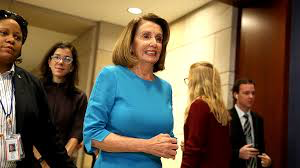 But the decision by Pelosi to block Rice from the committee, instead recommending several freshmen to fill the open slots on the panel, sparked outcry from members of the New York delegation, who felt like Rice deserved the position as the more senior lawmaker…..